Here’s a tip for all aspiring authors: if you can survive rewriting your work, again and again, without collapse, without quitting, you will see your work published. 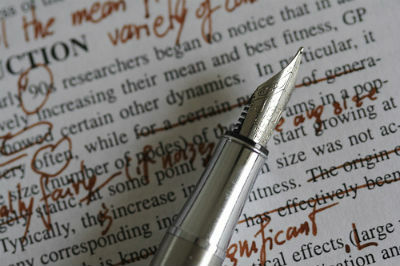 Rewriting is often what separates the unpublished from the published. I attended The Muse & The Marketplace, GrubStreet’s terrific writing conference, in May. For a fee, attendees can meet with an editor or agent who will read and critique the first 20 pages of their manuscript. Many people sign up hoping, nay, believing that this meeting will result in scoring an agent (despite all warnings to the contrary.) This year, the coordinators had created a “decompression room” where, post-meeting, you could discuss how it went with sympathetic Grub instructors. I went to the room to report out to my instructor how my meeting went (well, but not spectacular.) And I was confronted by a half dozen writers who looked as though they’d been diagnosed with terminal diseases. Hoo boy, I thought. Their meetings must not have gone well. While I sat, awaiting my instructor’s arrival, I listened. Two women had a back and forth about how harsh the criticisms had been in their meetings. One woman lamented, “She wants me to rewrite it.” As I listened it became clear that Asked-to-Rewrite had expected to submit 20 pages, get an agent, and waltz out of the room with nothing but praise. Anything less was abject failure. Plus, it meant she had more work to do. And as she spoke it became clearer that she didn’t want to do it. You are never going to see that book published, I thought. Not with that attitude. A resistance to rewriting is a resistance to editorial feedback, a resistance to change, and a resistance to work. I would love to write first drafts worthy of publication. I don’t. I need to rewrite, to refine and shape my narrative, to flesh out characters (or kill them.) This is how my work gets better. This is how most writers get their prose to a publish-worth place. I am a terrible gardener. I tend to plant a shrub and then I fail to water or feed it. I kill my lawn every single year. But I don’t yell at the grass for dying. It’s my fault. I didn’t take care of it. So too does your novel or story or memoir need care. It needs attention. It needs time. It needs other people to read and critique it. And it needs you to return to it, armed with new ideas and thoughtful suggestions about how to reshape it. And if you’re the sort of person who can accept criticism of your work, who can spend yet another night rewriting that first damn chapter, who can take a hard look at your work and think “This voice isn’t working. Let’s try another,” then you are on your way. You really are. Agents and editors want writers who are willing to do the work. So while you’re sweating over the umpteenth draft of your work, wondering if it’s worth it, just remember: you have less competition than you think. Because all the Asked-to-Rewrites who refuse to do so are not competing. Bravo, Stephanie. Can we somehow broadcast this from very tall buildings? I’d say I’d shout it from the rooftops, but I’m afraid of heights. Thank you, I needed to read this today. Forging ahead!